There are so many Barcelona tourist attractions that you’ll struggle to visit them all during a short city break. 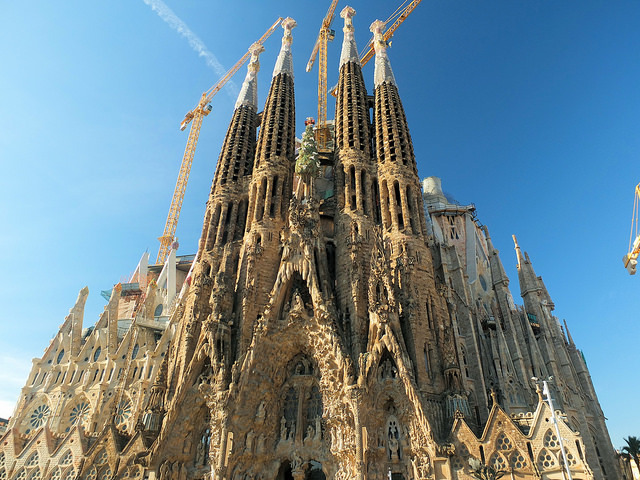 The highlight is the magnificent Sagrada Familia Cathedral but there are plenty more stunning buildings designed by Antoni Gaudí including La Pedrera (also known as Casa Milà), Casa Batlló and Park Güell. In addition, you’ll want to spend a few hours wandering around the Ramblas and the Gothic Quarter and heading over to Port Vell at the end of the Ramblas. The city’s hop-on, hop-off tourist bus services depart from Plaça de Catalunya providing visitors with the best way to see the main sights of Barcelona. La Pedrera (Passeig de Gràcia, 92): La Pedrera (Casa Milà) is probably Gaudi’s 2nd most recognisable masterpiece. It was built between 1905 and 1910 as a commission for the wealthy Milà family in the upmarket Gràcia district serving as an apartment and an office block. A visit to the Casa Milà allows you to get a taste of wealthy Catalan society a century ago as you wander through the fascinating rooms of the family home. The roof is particulary interesting with its selection of Modernist sculptures and chimneys from where you can see the Sagrada Familia in the distance. 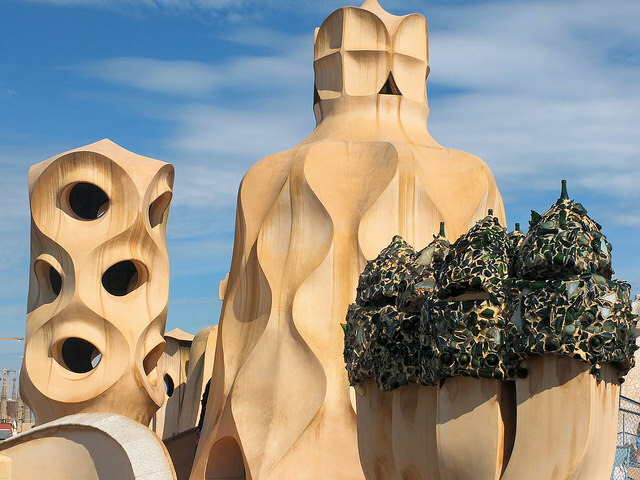 In the evenings during the summer months you can go on the roof of La Pedrera and enjoy ‘La Pedrera de Nit’ when you can enjoy a glass of cava (Catalan champagne) to the accompaniment of classical music. Casa Batlló (Passeig de Gràcia, 43): Just down the Passeig de Gràcia on the other side of the road from La Pedrera is another classic Gaudí structure. This building was also commissioned by a wealthy local businessman, Josep Batlló, to serve mainly as a family home. 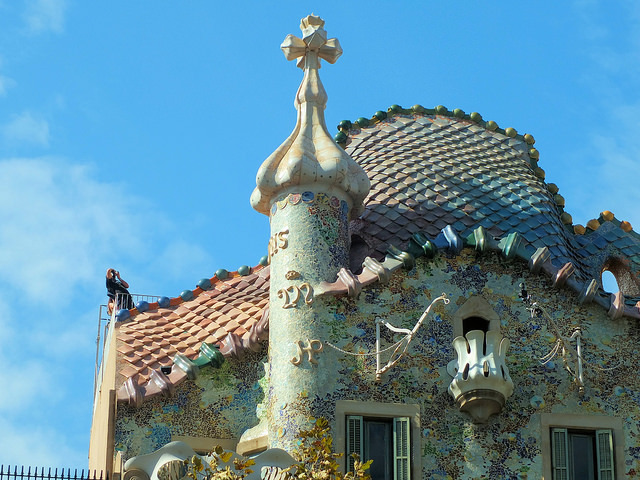 Although Gaudi originally designed Casa Batlló to look like St George’s Dragon your imagination can run away with you as you stare at the structure from outside. Typical observations are of tiles used to portray fish scales, balconies that look like bird’s nests and a roof than resembles a dinosaur’s back! Park Güell (Carrer D’Olot, 7): Park Guell dates back to 1900 when Eusebi Güell commissioned Gaudí to build a garden city intended for the elite of Barcelona society. As a real estate venture the property wasn’t a success with only two homes ever being built on it. Today Park Güell is a Gaudí park which is owned by the city of Barcelona and features a breathtaking selection of Gaudi architecture. Look out for the giant coloured lizard which is one of the city’s most photographed attractions. Casa Museu Gaudí is the house at the entrance with a spire where the architect lived for most of his last 20 years. Other Gaudí Buildings: As well as the Gaudi buildings described above there are around 25 more spread around the city. Not all of the works are open to the public but they’re still worth looking for. The biggest concentration of these buildings is in the Gràcia district of Barcelona just north of Plaça de Catalunya. La Rambla: It’s more than likely that you’ll be staying near the Ramblas on your stay in Barcelona. It will be central to your daily activity and nights out. It is a long boulevard which joins the Monument a Colom (Columbus monument) by the port to Plaça de Catalunya. All day long you’ll find all kinds of buskers and mime artists in action as well as stalls selling flowers, newspapers, birds and rabbits. Look out for Palau de la Virreina, a grand 18th-century mansion, which is next to the Boqueria market. In Plaça de Catalunya at the northern end of the Ramblas there’s a huge El Corte Inglés department store. Take the escalator to the 9th floor café/restaurant and marvel at the amazing view up Passeig de Gracia and over the rooftops of Modernist Barcelona. It’s a good place to take a break and to work out your bearings. Travel Tip: Be extremely cautious as you walk along the Ramblas by day and night as this is probably the single worst place in all of Spain for pickpocketing and bag snatching. The times you’re likely to be most vulnerable are if you stop to watch the man operating the ball under three cups scam as pickpockets operate amongst observers. At night overly pesistent prostitutes appear on the lower Ramblas, just ignore them and watch your wallet. You should also be aware of the ‘legal fleecing’ of unsuspecting visitors at some of the bars that line the Ramblas and charge astronomical prices often for enormous drinks that you hadn’t expected (be warned that a beer could be served in a litre glass!). Check the price list before ordering. Barri Gòtic The Gothic Quarter is just east off the Ramblas and contains medieval Gothic buildings dating from the 14th and 15th century in what was the centre of old Barcelona. It’s a maze of interconnecting dark streets joining together medieval squares. The main tourist attractions are the magnificent Gothic cathedral, the Ajuntament, Plaça del Rei and the Palau de la Generalitat. The city’s history museum on Carrer de Veguer is well worth a look. There’s a good selection of cafés and bars, especially around Plaça de Sant Jaume, so refreshments are never far away. Boqueria Market: The Mercat de la Boqueria is one of Europe’s great food markets, and is well worth well worth a visit. It’s a good spot to visit at breakfast time for excellent Spanish tortilla at one of the internal bars near the back. Further south is Barcelona’s Opera house (Gran Teatre del Liceu) after which the Ramblas begins to get seedy as you approach the sea with peep shows and the like. La Rambla ends at the Columbus Monument which you can go up in a lift for spectacular views up the Ramblas and across the harbour. Port Vell: At the bottom of La Rambla beyond the Columbus Monument is the bustling area of Port Vell. This was formerly the old port of Barcelona but today is an ultra modern leisure zone with bars, restaurants, shopping arcades, the Barcelona Aquarium and an Imax cinema. Another fun thing to do down here is to take a boat excursion on one of the ‘golondrinas’ which takes you around the harbour and along to Port Olímpic where the sailing events at the 1992 Olympic Games took place. La Barceloneta: Just a short walk north-east of Port Vell is the lively neighbourhood of La Barceloneta which was traditionally the living area of the port’s fishermen. In spite of its seemingly run-down appearance this heavily populated area has become a popular place to visit attracting many locals and tourists to its fine selection of fish restaurants lining Passeig de Joan Borbò. It is also home to Barcelona’s best sandy beaches which were created as part of the city’s pre-Olympics regeneration programme. These are very popular at weekends being only a stone’s throw from the city. There’s an interesting transport option for visitors called the ‘Transbordador Aeri’ which is a cable car linking La Barceloneta with Montjuïc. Port Olímpic: There’s a walkway along the seafront called the Passeig Marítim which connects La Barceloneta with the stylish marina of Port Olímpic. As well as serving an important role for the city’s yachting community this entertainment and leisure complex is an important venue on the Barcelona nightlife scene thanks to its stylish bars, restaurants and clubs. It was originally built in preparation for the 1992 Olympic Games and is home to the five star Hotel Arts which has become Barcelona’s residence of choice for many celebrities visiting the city. Montjuïc: Montjuïc is the hill which overlooks Barcelona from the southwest and is home to the Olympic Stadium which was used in the 1992 Olympic Games. It also has some excellent art galleries including the Museu Nacional d’Art de Catalunya (MNAC) and the Fundació Joan Miró. The best approach is to get to Plaça d’Espanya then climb the steps (or use the escalator) or take the Metro to Paral.lel and then the funicular railway up the Montjuïc hill. Olympic Stadium: The Catalan capital hosted the 1992 Olympic Games, an event that redefined the face of modern day Barcelona. The main athletics events took place at the Estadi Olimpic in Montjuïc. 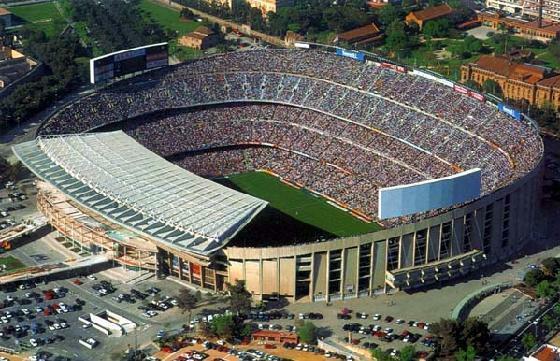 This impressive stadium with a capacity of 65,000 was originally constructed in 1929 when Barcelona hosted the World Fair. Having fallen into disrepair it was restored for the 1992 Games. The stadium is open to the public at no charge on non-event days. There’s a brilliant swimming pool complex at the Piscines Bernat Picornell right next to the stadium if you fancy a dip during the hot summer months. La Font Magica: On the terraces below the Palau Nacional de Montjuïc are a number of fountains including the largest one known as the ‘Magic Fountain’. Here you can watch a spectacular water, light and music display several times in the evening. From October to the end of June these take place every 30 minutes on Friday and Saturday nights between 7pm and 8.30pm. Between June and September there are displays every 30 minutes between 9.30pm and 11.30pm from Thursday to Sunday nights. FC Barcelona is one of the world’s greatest football teams and everywhere you go in the city you’ll see support for them. Their magnificent 98,000 seater Camp Nou stadium is on the northern route of the hop-on hop-off bus tour. The FC Barcelona Museum (Carrer d’Aristides Maillol) is located within the grounds of the stadium. You can choose to simply visit the museum area where there’s a selection of memorabilia including trophies on display or buy a combined ticket for the Nou Camp Experience which also provides access to the changing rooms and allows visitors onto the pitch. Not surprisingly this is one of Barcelona’s most popular tourist attractions. FC Barcelona Match Tickets: If you happen to be in town when there’s a match on you can pre-order Barça tickets and pick them up on arrival in the city or have them delivered to your hotel. Poble Espanyol: (Avinguda Marques de Comillas) This model Spanish Village was constructed for the 1929 exhibition consisiting of replicas of some of Spain’s most characteriestic buildings. In the evening it also attracts many visitors to the typical Andalucia flamenco show at the Tablao de Carmen. Picasso Museum (Carrer Montcada, 15-23): Barcelona is the city that shaped Pablo Picasso’s youth and this museum is the result of his wish that after his death his art would have a permanent impact on the city. Housed in a medieval palace complex in the Gothic Quarter, the Museu Picasso is one of Barcelona’s most visited tourist attractions. Much of the museum is devoted to Picasso’s early works and the chronological order of the exhibits allows visitors to appreciate the artist’s development. His most famous works remain in Madrid but this museum is still one of themost important collections in the world. National Art Gallery of Catalunya (Palau Nacional, Parc de Montjuïc): The Museu Nacional d’Art de Catalunya (MNAC) is one of Europe’s greatest art museums exhibiting works of Catalan art from the Romanesque period to the mid-20th century. As well as displaying the best collection of Catalan modern art in the world the museum is also worth a visit simply to see the magnificent Palau Nacional building in which it is housed. This palace was built on the Montjuïc hill for the 1929 World Exhibition providing breathtaking views of the city of Barcelona down below. Barcelona Museum of Contemporary Art (Plaça dels Àngels, 1): The Museu d’Art Contemporani (MACBA) has been the catalyst in the urban regeneration of the El Raval district of central Barcelona, just off the Ramblas. Even if you’re not particularly an art enthusiast it’s well worth a visit to the MACBA although you might find some of the exhibits rather strange. The building itself is an impressive work of modern art contrasting sharply the the rundown neighbourhood which surrounds it. The main attractions amongst the exhibits are works by prominent Catalan artists such as Antoni Tàpies and Miquel Barceló. Joan Miró Foundation (Parc de Montjuïc): The Fundació de Joan Miró is a modern art museum located in Montjuïc which is dedicated to the works of Joan Miró, Catalonia’s greatest 20th century artist. Only a selection of his many paintings, sculptures and drawings are on display at any one time with a tendency to focus mainly on the last 20 years of Miró’s life. You can Order the Barcelona Museum Pass for immediate delivery to your mobile phone.